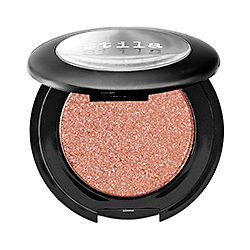 A highly pigmented eye shadow that creates a glittering wash of sequin-like sparkle. 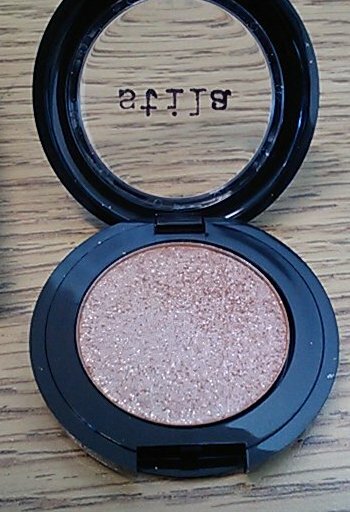 This eye shadow delivers instant glamour in a perfect blend of pigment and pearl that glides on smoothly and delivers a weightless wash of vibrant shimmer on the eye. 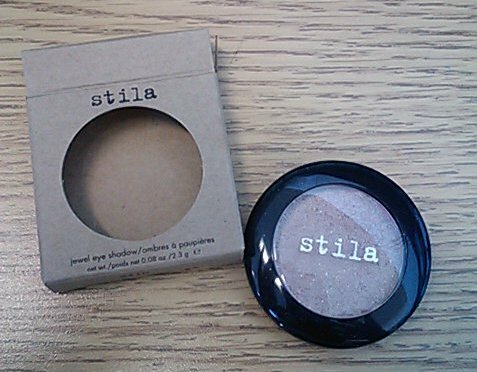 The high-tech formula provides excellent color release and all-day wear, plus the shadows are buildable and can be worn either wet or dry. 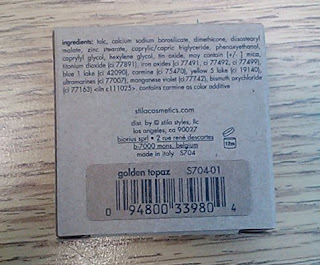 I bought this shadow to wear over the matte orange eyeshadows I bought the same day. I don't care for matte shadows, simply because I love the sparkly things in life, and this orange undertoned silver sparkly stuff seemed the way to go to allow me to wear the bright oranges I was finding in mattes, and sparkle-i-fy it for my preference. 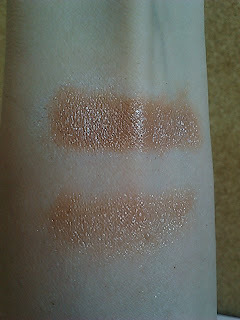 When I swatched it out, it did turn more taupe than orange when applied over primer. I have mixed feelings about that. For good, it is a nice, neutral shade that will work year round, and never look trendy. 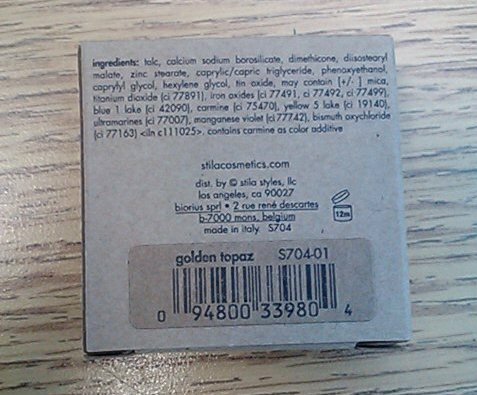 For bad, I like orange eyeshadow, so I would have liked it to be stay more orange. 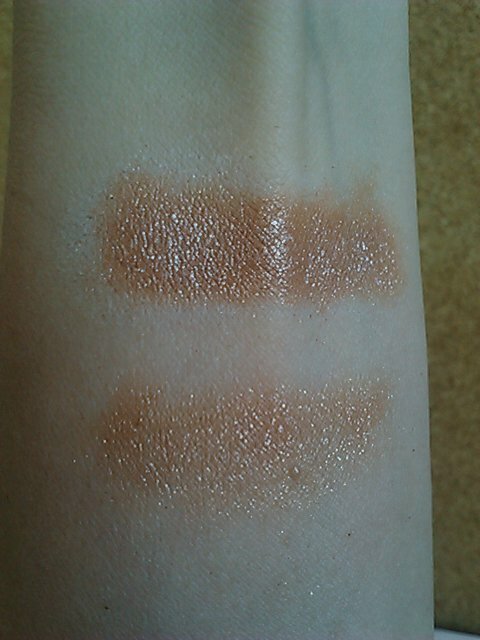 So, I swatched it out, and found that applying it to bare skin made it sheer and sparkly, while over a primer really deepened the color but kept the sparkle to about the same in real life. 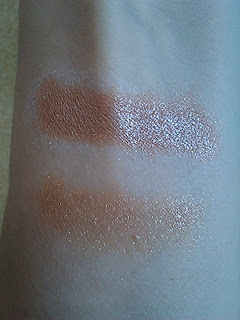 In photos, the shadow applied over the primer shimmered like crazy. I preferred the sheer and sparkly look, because it looked more spritely to me. Then... I tried to take it off. I scrubbed at it with a baby wipe. The color came off reasonably well. But, that glitter wanted to hang out and play. It looked like a baby fairy foofed on my forearm. Those sparkles stick! Now, to me, as a glitter lover, I like it that the glitter is sticky. That means I get a lot less fallout without having to wear primer. Indeed, when I wore it again this weekend on bare lids, I barely had any fallout, and the amount that did fall out looked pretty, flashing here and there on my cheekbones. 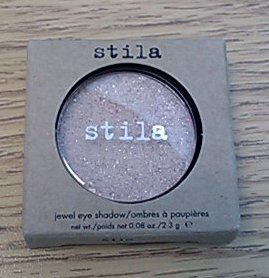 But, if you don't like sparkle that much, just do yourself a favor and steer clear of this eyeshadow. Even if you want to use it as a highlighter, you'll end up with glitter stuck to your eyelids face for at least another day. Glitter lovers won't care, but you matte ladies will probably hate it. You've been warned. Overall, I really like this eyeshadow, and I would definitely re-purchase it. Have you tried it? 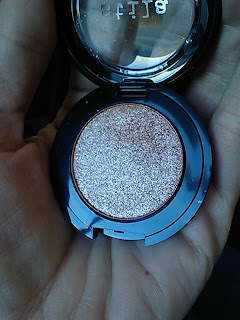 Do you have a glitter eyeshadow that you love and you think I should try?